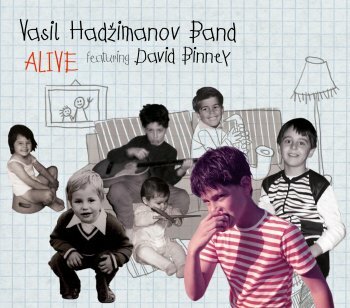 Serbian pianist, keyboard player and composer Vasil Hadzimanov started his Vasi Hadzimanov Band in 1995. His typical musical style, mixing Balkan folk rhythms and melodies with rock and jazz, has earned him a lot of respect. As a result, the VH Band has played numerous international festivals and has performed, amongst others, with Joe Zawinul and with Nigel Kennedy. "Alive" is the band's sixth album but it's their first international release. As the title suggests, the disc captured the band in concert at various locations in Serbia, recorded in October 2014. All members of the band contributed compositions to "Alive". It's an impressive set of compositions. My favourite piece is 'Nocturnal Joy', the first track. It has a beautiful melody and slowly develops into a great jazz tune. It also puts the spotlight on special guest / New York City based saxophone player David Benney. Beautiful !! Great energy! "Alive" is released on the MoonJune Records label.